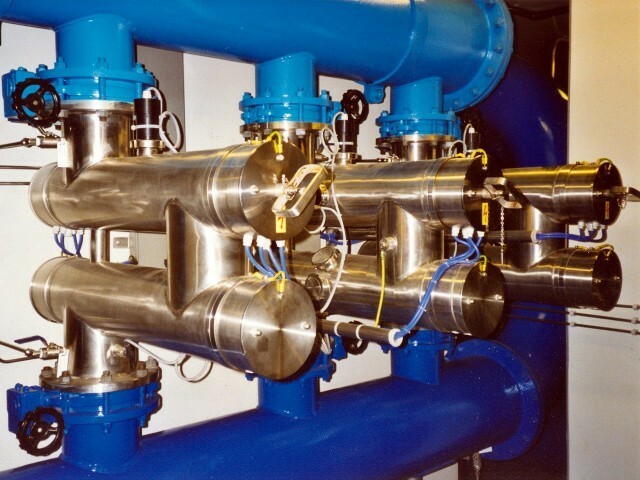 The UV installation is a stainless steel tube with one or more UV lamps. The UV lamps are placed inside a quartz glass tube. The UV-light (Ultra-Violet) wiil kill or sterilize bacteria, viruses etc. The advantages of a UV- installation to a chlorine installation is that UV light will not add harmful substances to the drinking water. To remove any staining on the quartz glass tubes the UV installation is often quipped with a mechanical cleaning device. 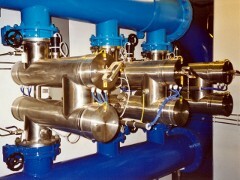 An UV installation is often installed in multiple units. On the photo you can see three units, two of them are in use. The third unit is spare and can be uses when there is a malfunction or maintenance on a other unit. 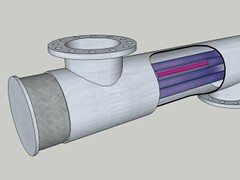 Look at an video presentation of a UV installation.